Make a statement with this fabulous Kenneth Cole Watch. This bold timepiece is designed with a combination of Silver and Rose Gold with a Mother-of-Pearl dial and Roman Numerals. 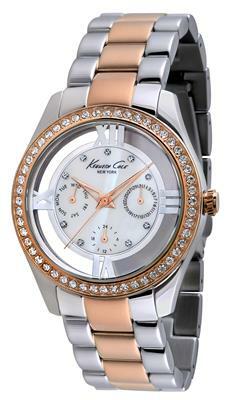 For a touch of glamour, this Kenneth Cole Watch is finished with a glittering crystal-encrusted bezel. This eye-catching Kenneth Cole watch is a must-have addition to your wardrobe, complementing your Silver and Rose Gold jewellery perfectly.